S-Band (13cm) receive antenna is a 18" DSS dish with a DEM 13ULNA preamplifier and one of the K5GNA modified TranSystem 3733 converters. 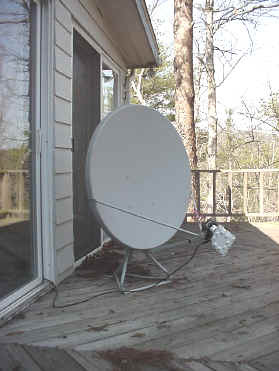 Using 90cm dish on porch with "strong-arm" rotator method - see "Activity on AO-40" entry for March 11, 2003. 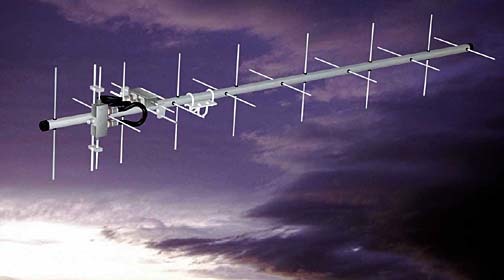 U-Band (70cm) transmit antenna is described in detail below - it arrived on Monday October 15, 2001. I was testing this setup on my east porch to check it out before mounting it on the roof permanently - on the 181o to 360o azimuth passes my house blocked elevations below about 40o - now that my setup is on the roof, this is not a problem. My transceiver is a Yaesu FT-847. I was using a FT-726 but I sold it - click here for info on the 726 sale. I had a Mirage D1010 - 100 watt 70cm amplifier - I sold it. Mount is Radio Shack tripod, with a 1 1/4" fiberglass cross-boom bought from Max-Gain Systems. I use a Yaesu G-5500 AZ/EL rotor - click here to see rotor info from AES. I'm using UniTrac for rotor and radio tuning automation. I placed a helix on my TranSystem converter to get circular polarization on S-band to reduce fading caused by the satellite spin. Although I have nothing to measure the improvement, I would say it's 3db better than the dipole, and as expected reduces fade. More information here. The specs. are 14.07dbc forward gain (between 435 and 436 MHZ) Front to back ratio 19db, E 36.4 degrees, H 40.2 degrees and overall boom length is around 70 Inches. Has 8 horizontal and 8 vertical elements with 1/4 wavelength spacing. Price is under $200 including the phasing lines. These are available for purchase from Pete at the GACA (Gulf Alpha Communications Antenna Inc) website at http://www.gulfalphaantennas.com/ - sometimes he sells them on eBay as vhfantennas. Corner reflector testing page here. September 11, 2001 - My first telemetry blocks captured with AO40RCV. Click Here to view the first telemetry block I captured, as interpreted by AO40RCV. Shift right click here then "Save Target As..." to save full raw file, then use AO40RCV to read it. Click Here to go to the AO40RCV home page. October 15, 2001 - Got the new U-Band antenna. October 16, 2001 - I am waiting on the next good pass for my test location - it looks like October 17th around 1900 EST will be a good time to try the uplink in my test location. October 17, 2001 - I could hear my U-Band uplink on my S-Band downlink, but only weakly. I need to eliminate some loss in my uplink hookup and try again on the next good pass that I can be home to work from my test location - it looks like Sunday October 21st. October 21, 2001 - I could hear my U-Band uplink on my S-Band downlink much better today but all signals faded later in my testing session. I called CQ several times but no answer. I will try again another day. Still using the test location. October 28, 2001 - My first contact - K2IYQ (Steve in Sonoma CA). My signal was pretty weak, but he was able to copy my call sign and I was able to copy his call-sign, name and location. November 2, 2001 - Working on my 90cm dish that I plan on using for S-band. November 4, 2001 - More work on my 90cm dish. Today I worked on getting the dish mounted on the rotor. November 6, 2001 - My second contact - KE4AZN (Mike) in Alabama. The new dish, with the circular "attachment", along with very low squint angles made reception excellent this evening. November 11, 2001 - Ordered a new Yaesu FT-847 (Details) to replace my FT-726. November 15, 2001 - Received my new Yaesu FT-847 but did not have time to use it due to firefighter training. November 17, 2001 - My third contact and my first on the new FT-847. It was with WW1Z (John) in New Hampshire. QSO went well except my signal was down because my U-band TX antenna was pointed toward (pictures here) my house and going through an air conditioning unit that was unfortunately in the way, for the test location. November 18, 2001 - Three contacts tonight. KA5SMA (Mike) in Tennessee, W6FOG (Neal) maritime in San Francisco and K9KK (Rick) in Norman Okalahoma. My signal was up and down tonight - I have narrowed it down to either the feed-line or the antenna - I will replace the coax and see if that solves the problem. November 25, 2001 - One contact tonight. WW1Z again. Once again my signal was down despite that I have replaced the coax, so it now looks like the GACA U-band antenna might not be performing as expected, so I am considering replacing the GACA antenna with a M2 436CP30 - more testing will be required. (Update: The GACA antenna is performing fine - see further down). February 16, 2002 - Today I copied telemetry from the MB. There were excellent signals from the bird due to the perigee pass and low squint angles - I also copied some voice QSO's. Shift right click here then "Save Target As..." to save the zipped full raw file, once received unzip and then use AO40RCV to read it. February 21, 2002 - I have ordered the UniTrac rotor/tuning interface. February 27, 2002 - Received my UniTrac rotor/tuning interface. At first I could not get it to communicate with the PC, but then I replaced the 25-pin to 25-pin cable between the two with a better cable, and presto it works! I was even able to get it to work with Nova. I didn't get to track any live satellites today, but I will try once I read the manual for it and Nova - there is a lot for me to learn on these programs. Today I also figured out that I ordered the wrong soundcard packet interface from BUXCOMM - it seems there are two models available for the FT-847 radio - the first is the R-3 which interfaces with the "DATA IN/OUT" jack (3.5mm jack) for use with USB/LSB modes and the R-FTMDIN which interfaces with the "PKT" port (6-pin mini DIN) for use with FM modes. March 3, 2002 - Heard the lower harmonic of the S2 beacon caused by its HELAPS power supply -on my TranSystem 3733 at 144.32542 (2400.32542) on MA 32 at 1644 UTC (1144 Eastern) today on 90cm dish and circular feed. Per Stacey Mills, "the signal is VERY weak (it is intentionally suppressed!) so hearing it is a compliment to your system." Also got my soundcard packet working today via the "PKT" port, but I was unable to access PCSAT or ISS, I did work some terrestrial APRS packet on 145.39. March 16, 2002 - Signals were excellent today due to the low squint angles. I was able to tune in the beacon today and get my UniTrac automatic Doppler tuning and tracking system to work and successfully decode the beacon in AO40RCV. I was able to get 130/140 good frames for 92% (see raw file below) - I only lost the ten frames because I was testing various buttons on the UniTrac screen. I also used my UniTrac to monitor some voice QSO's - next time I'll try to TX using my UniTrac interface. Click here to play a small .wav sample file of AO-40's beacon, captured after the squint was over 20 degrees. I was still able to copy some frames with good CRC's even with the squint this high. March 23, 2002 - More testing of the UniTrac system on beacon reception - I copied some frames with good CRC's from a 29 degree squint down to a below 20 degree squint pass. As the satellite moved away from my location the signal noise increased and the number of frames with good CRC's decreased. Shift right click here then "Save Target As..." to save the full raw file, once received, use AO40RCV to read it. March 31, 2002 - More testing receiving the beacon. April 2, 2002 - Ordered the 13ULNA preamp from Down East Microwave. April 9, 2002 - Took all the elements off of my GACA 70cm antenna today and reattached them using black electrical tape on each side of the plastic insulators. I tested the antenna receiving SO-41 and it worked very well despite the fact that SO-41's downlink is LHCP and the GACA antenna is RHCP (a 20db loss right off). April 11, 2002 - Received the 13ULNA preamp I ordered from Down East Microwave. Current plans are to test it on Sunday April 14th. April 14, 2002 - Signals were poor today due to equipment problems. April 21, 2002 - I fixed the problem from last week - a faulty N connector. Today I tested my 13ULNA using a DSS dish. See details here. Telemetry captured today below - some bad CRC's before I adjusted things correctly. Shift right click here then "Save Target As..." to save the zipped raw file, once received unzip, use AO40RCV to read it. 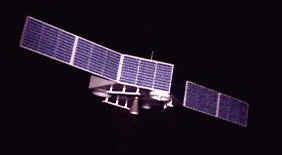 May 25, 2002 - For the last month I've been working other satellites. I moved my setup to the roof finally, but I didn't put the 90cm dish up there because I am concerned that the PVC pipe used for the cross-boom will break under high wind loading. I hope to replace the cross-boom with a fiberglass or aluminum cross-boom and get back on AO-40 soon. June 8, 2002 - I purchased and received a fiberglass cross-boom ($59) from Max-Gain Systems last week and hope to be back on AO-40 soon. August 10, 2002 - Still haven't got the fiberglass cross-boom mounted but I tested my 13ULNA using a DSS dish. See details here. I captured some telemetry today with squints as high as 38 at 1425 UTC. August 16, 2002 - I ordered a RIGblaster Plus today - it combines both PSK31 & packet into one box that interfaces to the soundcard in my computer. March 11, 2003 - Back on AO-40 after a long time off. 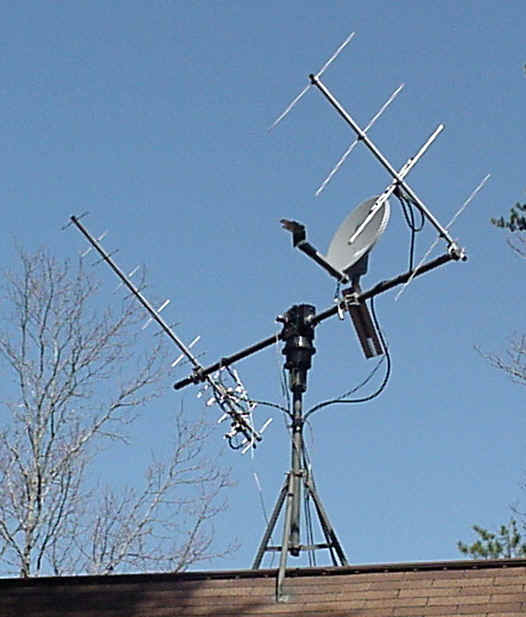 Using my 90cm dish on my East facing deck with the "strong-arm" rotator method (see picture below). Worked GW3XYW - Stuart. Also captured some telemetry frames today. Fiberglass cross-boom has been on the roof for several months holding my VHF and UHF satellite antennas. See the latest from AMSAT-DL - click here for the original site, or for the mirror site click here or here . Click here to see a photo of the antennas on AO-40.